For me, The Collected Tales of Nurse Matilda was the trilogy that would never end. I toyed with the idea of stopping midway but, having not finished a few books in the recent future, I felt compelled to complete this one - even if I didn't really care for it. I started out with the first book in this (gratefully short) series by Christianna Brand, Nurse Matilda (published 1964.) I then went on to read Nurse Matilda Went to Town (1967) followed by Nurse Matilda Goes to Hospital (1974.) At the end of the trilogy I would have to say that if you've read one, you've read them all. There isn't much variety in the children's behavior, per se. It's all bad. The Nurse Matilda stories were originally made up and told to Christianna Brand and her cousin, Edward Ardizzone by their grandparent. When young Christianna and Edward grew up, she wrote down the stories and Edward illustrated them. Christianna said she wrote the books solely for the purpose of entertaining her readers. If you think disobedient children is a silly subject matter, then you'll be entertained. If you are the mother of small, impressionable children, and you feel like you spend most days correcting and training your children to behave in society - then these books should probably annoy the crud out of you. The books follow the Brown family. They have so many children that they are neither named nor counted. The reader is left to sort that out for themselves. "Mrs. Brown was very sweet but she really was rather foolish about her dear, darling children, and never could believe that they could really be naughty." Because of Mrs Brown's lack of discernment and desire to maintain any sense of order in her house, and due to the sheer volume of children (so many they aren't specifically counted out in the books), the family employs nannies. The agency who supplies the nannies have sent 17 their way, only to have them all be more or less run out of the house by the children's bad behavior. Mr. and Mrs. Brown keep hearing the phrase, "What you need is Nanny McPhee" but they aren't sure who she is or how to find her. In a Mary Poppins sort of way, she just shows up as-needed. "The more they don't want me," said Nurse Matilda, "the more they must need me. That is the way I work. When my children don't want me, but do need me: then I must stay. When they no longer need me, but they do want me: then have to go." Nanny McPhee arrives to instruct the children in seven lessons, such as how to go to bed when told, how to say please and thank you, and to do their schoolwork. 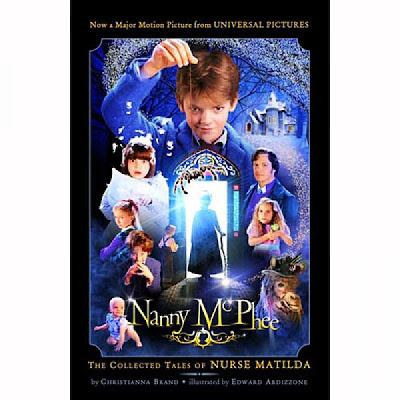 The children gradually come to realize that when Nanny McPhee gives an instruction, she means business and there will be consequences if her rules are not followed. (She carries a big, black stick and when she thumps it on the ground, children who are being disobedient are compelled to go on acting out their disobedience until they are tired and weary of it and begin to recognize the value of good behavior.) By the end of the first book, the children have come to value and respect McPhee, who is the only person who has ever made them tow the line. Let's just say though that the children are slow learners with bad memories because it takes two more books full of equally, if not possibly more atrocious behavior, and two more visits by Nanny McPhee to sort out How One Should Behave. (I reckon that there could have been more books in the series but how many times do you honestly want to put up with reading about children that the author tells you no one else likes because they are so ill-mannered as to be considered something of a blight on humanity!?) I was exhausted reading these books! The task of reading about them seemed so repulsive and overwhelming, even though this was fiction. In reality though, I know that these books will have appeal because there is truth in it. I'm sure I'm not the only one who has seen a disobedient child acting out in public in a manner that makes others cringe. We've all witnessed children screaming in public, hitting their parents, being mean to other children and thinking it's fun - and all the while their parents seem to be turning a blind eye and making excuses. It's nauseating and it makes me worry for the future of the child who never learns self discipline or self control and therefore goes about wrecking havoc on the world around them. This inevitably results in the child making very few friends, which is horrifically sad and exactly what we see happening in the Nurse Matilda books. The only ones who can seem to stand the company of the Brown children are the Brown children. Again, it is sad and unfortunate. No, I'm not a fan of these books. I recognize that they are written to entertain but I cannot laugh at the deviousness of young ones who are never checked-up on and who no one likes. To me that's not funny. That's just disheartening and hard to deal with because you know that the future of any such child is going to be very difficult. How, exactly, are these funny? I simply do not see it. I haven't read the books or seen the movies, but they don't sound appealing at all. Unless maybe they were trying to get across to children how unappealing their bad behavior is. But ti doesn't sound like that's the aim. I really enjoyed the story. I found it to be more for older kids in theme, and thus more enjoyable to me as an adult. I also read the book (not all of it, I don't think), but I remember that even Emma Thompson said that the stories in the book weren't really used and that Nurse Matilda was a little naughtier. In fact, I think she said the same thing -- that they didn't learn and she found that odd. In the movies, the kids do learn! What I like about the Nanny tv show is that she shows the parents how to correct the behavior. I don't think I could stand to read a book where the kids were constantly bad. As it is we've had to take a break from Eloise and Angelina Ballerina because of the sass a certain little "princess" was beginning to display. I loved the first book. It was to hilarious to read about all the trouble the children could get into, and through it all they are still good-hearted kids, no matter what sort of crazy shenanigans they get themselves into.